This Saturday, we’ll be continuing our ‘Let Down’ campaign, this time targeting some of Hackney’s most greedy, exploitative letting agents. Our MONOPOLY themed action will be FUN and CREATIVE and everyone is welcome – If the mood takes you, bring bowler hats, top hats, and any other fat-cat props you have lying around! 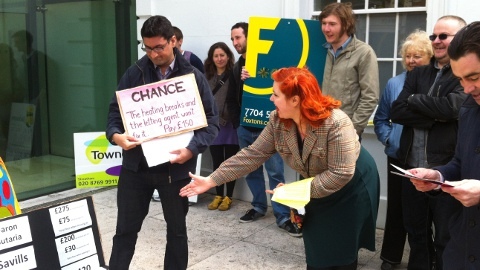 This action has been organised by private renters in Hackney and across East London. Tags: Activism, letting agents. Bookmark the permalink.